When I first visited Abu Dhabi a couple of years ago during Ramadan, I was unable to visit the Grand Mosque as it was open only to worshipers during the month of fasting. But on my second visit to Abu Dhabi, I headed straight for the cities’ main attraction and finally got to observe this marvellous structure for myself. 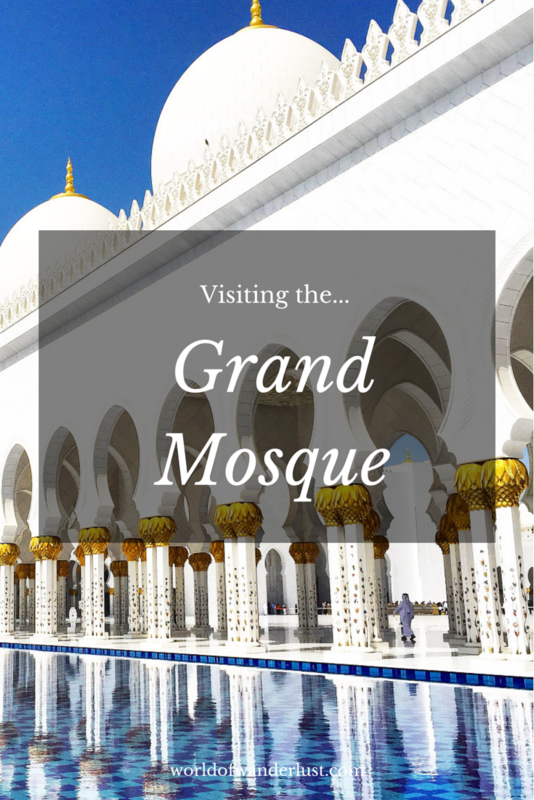 So here’s a quick guide for first time visitors to the Grand Mosque to ensure you know what to do, what not to do, and most importantly, what to wear! Dress Accordingly – Nothing could be more important than to get this right on the day you intend to visit the mosque, as with any mosque you visit. Dressing accordingly is your way of showing respect – see here for a full guide on how to dress. Women – Must cover the head, wrists and ankles. If you are not dressed appropriately, you are able to ‘hire’ an abaya for no charge. This will cover you head to toe and prevents disappointment, but you should still arrive in loose fitting clothing covering the knees (ankles better) and wrists. Removing Shoes – All visitors must remove their shoes before entering the mosque. Don’t worry, they’ll be there when you return! Joining a Tour – Is a great way to learn about Islamic and Emirati culture. These run for 60 minutes a number of times a day, except Fridays. What’s more – they’re complimentary! For a much more informative experience, see the tour guide times here. Don’t Forget to Look Up! – Inside are 24 carat gold gilded chandeliers, the world’s largest hand knotted carpet, and no less than 1,000 columns. Be Respectful – Always ensure your head is covered and wear your appropriate attire throughout your visit. Some celebrities have been asked to leave after taking photos that have been considered disrespectful. Take Plenty of Photos – You will be glad to learn that photos are allowed and more than welcome inside and outside of the mosque. Just be sure to respect any boundaries/barriers, or you will be met with a disgruntled security officer yelling from afar. Is there an entry fee? No. Are there guided tours? Daily and they’re free! What can’t I do? Smoke, take food or drink. Visit at 4:30pm – and catch a glimpse of golden hour, along with the perfect sunset. It’s also a cooler time of the day to visit. Opening hours: Open daily to visitors, except on Friday morning, which is for worshippers only. The opening hours are 9am to 10pm (last entry at 9.30 pm) – Saturday to Thursday and 4.30pm to 10pm on Fridays. Complimentary one hour guided tours run (Sun-Thurs) at 10am, 11am and 5pm. Friday times are 5pm and 7pm and Saturday 10am, 11am, 2pm, 5pm and 7pm. I visited it two weeks ago. Its all fresh in my mind. AAA I must go there! This mosque is definitely on my list for such a long time!It looks absolutely awsome! Dear David. Please get your facts right. Women can certainly drive here in Abu Dhabi. We can also work, go out in our 2 piece bikini to the beach and have ladies night every Tuesdays at the pubs and bars. Yes, there are rules to abide, but women are most definitely not oppressed. Ps- it’s a beautiful mosque by the way.. Observing the dress code in any religious setting is so important. When I visited various cathedrals in Italy they had similar rules, so it’s good that you mentioned it in your post. Nice article. This place is on my list and can´t wait to go. 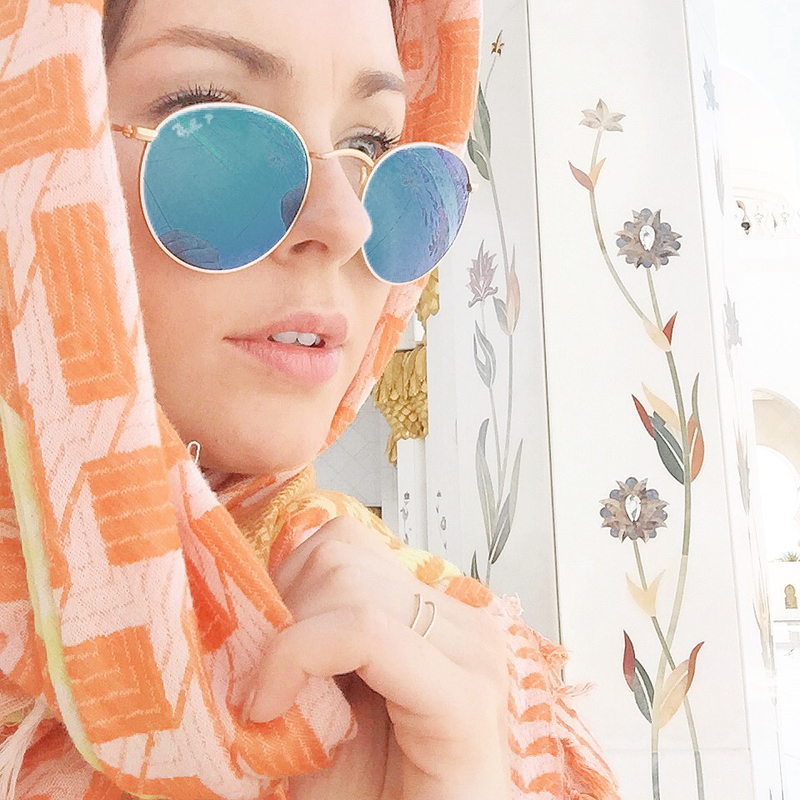 Can anyone help me, what APP does Brooke use to create the heading on top of the second image ‘Visiting the Grand Mosque’? This was meant to be a reply to David below. Women can certainly drive in AD. I live in Dubai and drive there for work all the time. And you can wear a two piece bathing suit too … Where are you getting this false info? It’s astounding to me that non-Islamic women want to visit nations where they would face arrest if they were to go about their day in Abu Dhabi as they go about their days at home. The writer didn’t mention the fact that women can’t drive in Abu Dhabi or even sun-bathe in a two-piece bathing suit at an Abu Dhabi hotel. And, no one with an Israeli passport is allowed into Abu Dhabi. I love it how you often go to places like these that aren’t the typical touristy countries. Adding this to my list! I love visiting mosques ever since visiting Istanbul, and this one looks especially stunning. Thanks for sharing, your pictures are lovely as always! The mosque looks GORGEOUS, I love that people can take photographs – its usually uncommon for religious buildings. I hope to visit Abu Dhabi one day, will definitely go to this mosque if i do! Such a nice way to experience another culture! Wow, your pictures look great. I definitely have to visit Abu Dhabi some day. Such a really pretty mosque! Very interesting destination. I’d love to spent a week or two there. Wow, how breathtaking. I would love to visit the Grand Mosque. Its so important to be respectful in places of worship and I’m so glad you have shared this as well. The photos are truly stunning, I cannot even imagine what it would be like to be there! !